Breakthrough findings in glutamine absorption prompt a revolutionary invention. MHP Glutamine-SR is a breakthrough in Glutamine Absorption allowing 300% greater absorption. 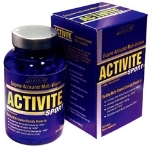 Time release formula insures distribution to muscle tissue over a 12 hour. Glutamine-SR is the most bio-efficient and powerful Glutamine supplement in the world. The Micro-Feed Technology also increases bio-availability and utilization of L-Glutamine by providing a controlled steady supply for 12 straight hours. This constant supply and replenishment of Glutamine will keep you in an anabolic muscle building state and prevent catabolism. Glutamine-SR's 12 Hour Sustained Release Micro-Feed Technology has raised the standards in glutamine supplementation, making Glutamine-SR the most bio-efficient and powerful Glutamine supplement in the world. Based on these facts, the Glutamine you are taking right now is not providing the anabolic muscle building environment needed to build rock hard muscle and improve recovery. 70% of it never reaches muscle tissue and 90% of it is gone in 1 hour, leaving you with a low dosed short supply of Glutamine. The end result is very little anabolic activity and can actually lead to catabolic muscle wasting because you're relying on your glutamine supplement to supply and replenish the glutamine needed and it just isn't delivering. Directions: Mix one scoop (approx. 1 rounded teaspoon) with 8-10 oz of water or your favorite beverage 1 to 2 times daily. 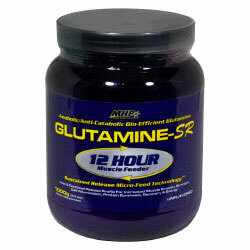 Glutamine-SR can also be added to your protein or meal replacement supplement.